The Brotherhood of British Scouts (BBS) was founded in 1909 to spread Peace and Christianity amongst the young, initially in the United Kingdom, and later World Wide in 1911 with the formation of The Order of World Scouts (OWS). Therefore, we became to be known as the Peace Scouts. This is opposed to the scouting organisations that were directing its members towards the military to protect and preserve the Empire in those early days. We can rightly claim to be the oldest scouting association in the UK and in the World but at the same time the most modern in our outlook towards our young members, giving them great adventures, great experiences of achievements and confidence. Most importantly, we do this without any political or change culture interference that just disrupts, and leads to confusion and upset. As it is such we have seen declining membership numbers for those associations so caught up in these types of regimes. Our Aims are to develop young people to become good citizens, by developing their characters and providing them values to face whatever they encounter in their life, whilst maintaining the true and high values of with happiness and Christian Traditional Scouting. You will instantly see that we are upholding the true scheme and values that had given scouting its prestigious position and the great respect World Wide that came from these traditional values and high standards. If these are your objectives and value then why not come and join us? Both nationally and internationally we are a growing organisation in times when scouting numbers are diminishing, why, because scouting can only take one form, otherwise it is just another youth club. The form and standards for scouting are well established, they do not have to be continually reinvented. Where and whenever our Scouts, Senior Scouts, Rover Scouts, Wolf Cubs and Beavers are seen in public they are instantly recognised, not only for their smartness and discipline, their uniform tells all and gains the respect the general public have for this; in addition the Scouts, Wolf Cubs and Beavers are proud to wear the uniform for which they are complemented endlessly, that not many of the other scouting associations can claim. Of course uniform is not everything, there are the essential elements of the Scout Promise and Scout Law long established and proved, with no changes required. The Scout, the Wolf Cub and now the Beaver structured training, easily understood by the young membership who love the progression through the simple training programmes; training programmes that the general public understand and can recall from their days in Boy Scouting and Girl Guiding, that granddad, father and mother can help them through. So if you want to be a real Scout and really practice real Scouting, and join a very friendly true Scouting spirited organisation, then it is time now for you to come on board? 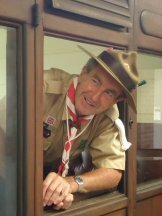 The Grand Scout Master David Cooksley invites you to come on board.